Corporate America threw Wall Street a record-shattering party last quarter. 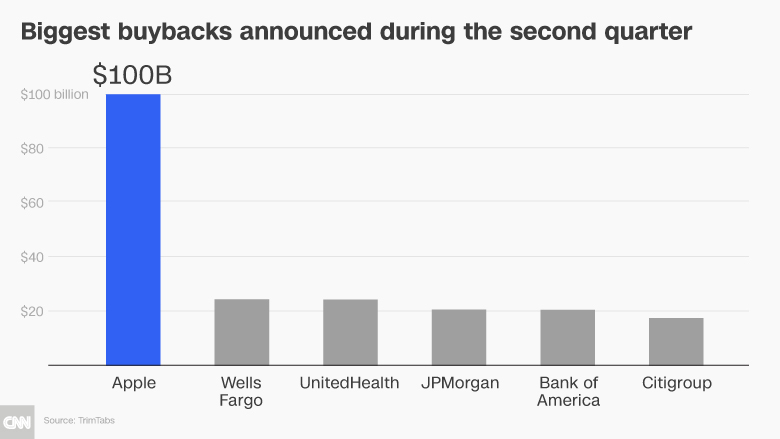 The buyback boom is terrific news for shareholders — and corporate executives. When companies repurchase vast amounts of stock, they provide persistent demand that tends to boost share prices. Buybacks also artificially inflate a closely watched measure of profitability known as earnings per share. The Republican tax cut created a windfall for Corporate America. The legislation slashed the corporate tax rate to 21% from 35%. It also gave companies a tax break on foreign profits that they return to the United States. The tax law and strong economy have combined to fuel record profits. CEOs are choosing to use a large chunk of that money to reward shareholders. S&P 500 companies repurchased $189 billion worth of stock during the first quarter, topping the record set in 2007, according to S&P Dow Jones Indices. Apple (AAPL) alone bought back $22.8 billion of its stock, the most of any company in any quarter in US history. Related: Are stock buybacks deepening America’s inequality? Of course, anything that helps the stock market can help the many American households that own shares directly or indirectly through retirement plans. 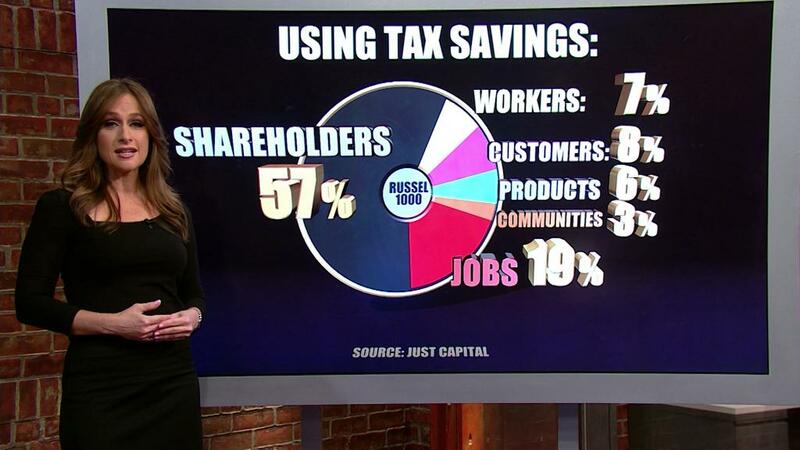 However, critics of buybacks argue they disproportionately benefit the rich. That’s because the top 10% of households owned 84% of all stocks in 2016, according to research from NYU professor Edward Wolff. Corporate America has shared some of the spoils with workers. More than 5.5 million employees have received a tax cut bonus, a pay raise or a sweetened 401(k), according to the White House. But shareholders are coming out far ahead. TrimTabs notes that the $436.6 billion of buybacks announced during the second quarter would have paid for a $1,000 bonus check to be sent to 6.8 million workers — every single trading day. A stated goal of the tax law was to encourage businesses to spend more. But it hasn’t helped much, at least not so far. Real nonresidential fixed investment, one broad measure of business spending, increased a solid 6.1% during the first quarter. While that is healthy growth, it was roughly in line with recent quarters and was slightly slower than the end of 2017. It’s possible that second-quarter economic growth figures, due out later this month, will show companies spent more on equipment, factories and other investments that create jobs and boost wages. However, researchers at the San Francisco Federal Reserve said on Monday that the tax law may not pack much of a punch because the US economy was already healthy. Washington normally stimulates the economy during a downturn, not a boom. The San Francisco Fed said that recent research suggests the tax cuts could boost the economy very little — or perhaps not at all. A safer bet is that the explosion of buybacks will help enrich corporate executives, whose compensation is often linked to their share price. Last month, an SEC official detailed a disturbing trend: In the days after companies announce buybacks, execs quietly cash out their own shares. Daily stock sales spiked from an average of $100,000 to more than $500,000 per executive, according to SEC Commissioner Robert Jackson Jr.
Defenders of buybacks argue that they are a legitimate use of excess cash. The money doesn’t vanish. Shareholders can use their winnings to boost the economy by investing in new companies or purchasing a home.